This healthy, delicious dip/spread is made with olive oil, low-fat Greek yogurt that’s been infused with fresh garlic and rosemary and puréed until it’s smooth and creamy. It can be easily dressed up by topping it with a handful of toasted nuts. It’s also good as a spread for sandwiches or burgers. The pistachio add a little crunchy element that is missing from a lot of dips. A fresh rosemary gave a really nice Mediterranean taste and I actually found it better than the usual recipe. 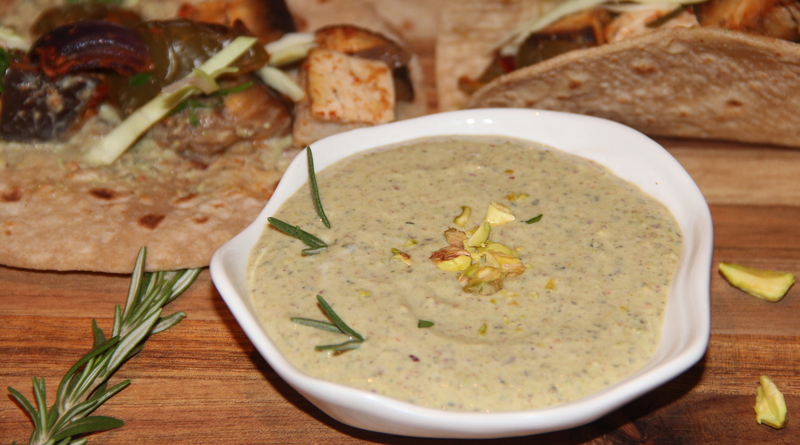 Place pistachio, rosemary, garlic in a blender or food processor and blend until crushed. Now add in Greek yogurt, lemon juice, salt and process until combined. Finally add olive oil whizz once and scrape into a small bowl. Posted on December 3, 2014, in Dips, Dips, Indian, International. Bookmark the permalink. 12 Comments. Thank you…It was a great combo together..